Recently, a few of us flew down to Dallas to attend the Natura Bissé skincare bootcamp! If you are not familiar with Natura Bissé, we are about to fill you in on some keyproduct knowledge and why you must have these products in your arcinal of skincare. Founded in Barcelona in 1979, Natura Bissé is based on the science of Natural Free Form Amino Acids. Breaking down the protein chains and using amino acids in their free form allows the product to penetrate deeper into the skin, offering greater results. Natura Bissé is constantly researching and developing innovative products that use the highest concentrations of effective ingredients. Did you get all of that?! In essence these products will do what they say and offer amazing results. Now lets dive into our favorite 5 products. An *at home* peel that contains 5 Alpha Hydroxy Acids to chemically exfoliate and remove dead skin cells and promote cellular turnover. The Glyco Peel provides instant rejuvenation while improving wrinkles, lightens dark spots and eliminates imperfections. The peel is great for all ages and skin types and doesn’t result in any downtime or irritation. Recommended use is 2x per week for 6 weeks. When we break down each application, the cost per professional treatment is only $25.00! Compared to one peel at a spa that usually runs around $75.00+. Great for EVERY client! Known as their “smart cream” the Diamond Extreme reads your skin and delivers the right amount of hydration over a 24 hour period. Oily in the T-zone, dry on the cheeks? Don’t worry, it adapts naturally to the different areas of the face based on your hydration levels. It’s great for all skin types and especially great for the blustery winter months! This cream also promotes firming action and improves elasticity. Fine lines and wrinkles are noticeably diminished, while it also provides a dual lifting effect (both internally and externally). Sweet Pea Extract and Edelweiss also protect against the deterioration of skin proteins. What more could you ask for?! This eye cream does it all! It improves fine lines around the eyes and dramatically reduces the appearance of dark circles. Just like the Diamond Extreme cream, it provides a dual lifting effect and offers optimal hydration 24 hours a day. Packed full of ingredients like Artemia Salina Extract to generate the energy necessary to stimulate cellular metabolism. *Fun Fact* The Diamond Extreme Eye helps control the keratinization process….you know those little white bumps around the eyes known as milia? 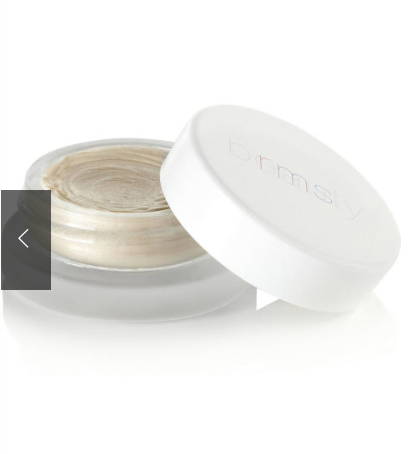 This amazing eye cream also contains light interfering pigments (the gold tone) that soften the skin and erase the appearance of dark circles and fine lines. Living in a city the water usually isn’t the best can throw off your pH levels and leave impurities to develop on the skin. This toner eliminates and detoxifies those impurities that are left behind after cleansing. Unlike other toners, the Cure Hydro Gel Toner does not contain alcohol and has a gel like consistency, leaving the skin hydrated and soft. It contains green tea extract that calms, soothes, and neutralizes free radicals thereby demising skin irritation and dryness. When you think it couldn’t do more…you’re wrong. The toner also contains Essential oils native to the Mediterranean, such as Olive leaf and Mandarin, which are power packed anti-oxidants that restore the skin’s radiance within its deepest layers. Through research, Natura Bissé found that the skin can only absorb 6% of pure Vitamin C at a time, and from there packed it into a serum. If you do not know, a serum provides the highest concentration of ingredients and will deliver the most results, in comparison to a cream. This serum contains Sodium Ascorbic Phosphate, which converts into pure vitamin C when it penetrates the skin (using your skin as an active ingredient! ), supplying all the beneficial properties of Vitamin C. It helps to repair skin that has been damaged by the sun, and is ideal for repairing and protecting skin before and after summer. Also containing an anti-aging and healing effect that renews skins firmness and elasticity, among lightening dark spots on the skins surface. It’s perfect for those that have dehydrated skin and also smokers. Blackheads are treated with the ascorbic acid, and the skin is left feeling firm and soft! Natura Bissé contains 150 products that cover all of the skin’s needs. Visit us in store to pick up and learn what products would best suit you, trust us your skin will love you for it! Comment below to let us know what products you want to try! After our last post you took our advice and got your brows tinted and waxed with one of our estheticians. They filled in your brows and they looked awesome…but what happens when you get home and try to recreate the look yourself? Whether you want a natural or bold look, follow these easy steps to get your perfect brow! With an even LIGHTER hand, start filling in the front of the brow. (CARA’S TIP: it’s important not to go too dark in the front or you will lose the natural look.) This should be the lightest part. Finish by filling in the tail end of the brow and brush out all hard lines using a brow shaping brush. When creating a bold brow use the same method as the natural brow, but with a heavier hand. When drawing the straight line on the underside of the brow, it’s important to keep it as defined as possible. Using RMS concealer and a concealer brush, create clean lines along the top and bottom of your brow. We recommend using two concealers. One a shade lighter to highlight the underside of the brow, and one that matches your skin tone. Finish with a brow gel, here we have lots to choose from but our favorite is ByTerry! We used the NARS Brow Perfector for the natural brow, and the Kevyn Aucoin Precision Brow Pencil for the bold brow. The concealer that we used was the RMS Un-Cover Up. Stop into Arch to pick yours up or purchase online. Any tips or questions? Feel free to comment below! Brows have made quite the presence on social media these days, and we would like to help you reach your full brow potential, after all that is what we were founded on! We do everything from waxing and tinting to finding the pefect brow pencil to help channel your inner Cara Delevinge. You may find youself scheduling an appointment with one of our brow experts before you even finish reading this post! Here’s an image of Hayley’s brows before we got started! First we began with a tint, choosing a shade that matched her hair color. Brow tinting gives the brows a fuller more defined look. Great for those with light brows or someone who wants the appearance of fuller brows. Tints are similar to a semi-permanent hair color but designed specifically for the brows, and naturally start fading over the course of 4 weeks. We suggest getting one done each time you have your brows waxed! While still maintaing the natural brow shape we continued with a wax. We measured out Hayley’s brows based on her facial measurements to show where they should start, arch and end. This helps us achieve a custom brow shape. At this point, we will help point out areas to work on growth if necessary! Viola! Easy as 1,2,3. Hayley is left with beautiful full and defined brows. At the end of the service we concealed the redness and filled them in. At each of our stores we carry numerous makeup lines that all have great options for brow pencils. Need any tips? Our licensed experts will be happy to choose the correct brow pencil for you and teach you the proper way to fill them in. Going back to school is stressful *for everyone*, going back to school while keeping up with work-also stressful! School, work, grades, bills, is there any other feeling other than stress?! And what does stress mean? It means breakouts and blemishes, and lots of them. Why don’t you go ahead and add that as one more thing to stress about. So what’s the secret? It’s the everyday cleansing balm by #evelom vs. the Ceramic Slip cleanser by #sundayriley. Using them everyday, half of us here at Arch Madison are using the Eve Lom and the other half are using the Ceramic Slip. Both of them resulting in flawless skin, so which do YOU pick? First things first, let’s talk Eve Lom. This balm cleanser (voted number one cleanser in the world by Vogue) is going to keep the natural oils in your skin while maintaining a refreshing and clean feel. Use up to twice a day on dry skin, gently massage into face. (BONUS POINTS: it fully removes eye makeup and comes with a full size muslin cloth to provide ultimate exfoliation & cellular renewal). Clove, Eucalyptus, and Hops oil will be just what you normal/dry skin ladies will need to drain toxins and tone the skin! What about oily and combo skin? No need to worry, that’s where Ceramic Slip comes in. The French refined green clay will strip all excess oils and impurities, without leaving the skin feeling tight and dry. Diminishing pores, it’s guaranteed to transform your skin into ceramic smooth porcelain. Massage this gentle, foaming, essential oil packed cleanser into skin once a day to tone, balance, and glow! Rock that first day back not only blemish free, but glowing and radiant! Stop in for a recommendation! You’re promised to get personal service to help pick out one of our favorite (and necessary) cleansers! See you soon, and in the mean time, live pretty! Can’t stop, won’t stop! Gigi Hadid has taken the modeling world by storm and has recently extended her talents to include acting, specifically in a Calvin Harris’ “How Deep is Your Love” music video. We couldn’t make it through without taking periodic pauses to admire her jaw dropping, blonde locks. After doing some research, it came as no surprise that the stylist responsible for Gigi’s looks used products from both R&Co and Oribe. In the picture above, and as seen in the video, Gigi is sporting a perfect, voluminous blow out. Who’s to thank? Stylist Jennifer Yepez and R&Co. As quoted in Allure Magazine, “I [Jennifer] began by spraying R+Co Dallas Thickening Spray from roots to ends and misting R+Co One Prep Spray just on her ends.” Sounds easy enough, right? Next, she told Allure that she used a medium sized round brush and blow-dried the hair section by section, clipping the sections up into large loops as she went. After the curls set, she brushed the hair out with her Mason Pearson Brush. Watch the video here. Afterwards, you’ll be racing to your nearest Arch to get your hands on these products. Who knew that supermodel status hair could be so easy? Here at Arch, if there’s one thing we’re not lacking, it’s top of the line nail polish. Whether you’re stopped by Smith & Cult’s glitzy-cool packaging, Deborah Lippman’s sparkly, funky colors, or the modern, chic appearance of RGB, all of our nail polishes are guaranteed to be just as attractive on the formula side. All of our brands are “5-Free” meaning they’re made without 5 of the most common (and toxic!) 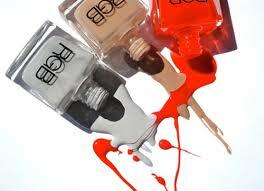 chemicals found in many nail polish brands. Read on to learn all about the yucky stuff you’d be choosing to live without when using our polishes! Dibutyl Phthalate is an endocrine disrupter and toxic to the reproductive system. No thanks! Toluene is toxic to the nervous system, impairs breathing, causes nausea, and has been linked to developmental damage to the fetus. Pass! Formaldehyde is a widely known, major carcinogen. Need we say more? Formaldehyde Resin is a derivative of Formaldehyde. It’s not quite as toxic but is an allergen nonetheless. Camphor can cause liver damage in rare cases when it comes into contact with skin. It’s also linked to seizures when ingested. Nail biters beware! So now you might be wondering what the chances are that any of these chemicals actually cause you any harm, seeing as only a relatively small amount of nail polish is used at any given time. Think again. Nails are porous, especially when wet. Also consider how often we touch our face, especially our eyes! Doom and gloom aside, there’s an answer to this problem and it comes in all different shapes, sizes and colors. Come find your perfect “5-Free” shade today! Not all three lines are available at all locations – please call to confirm! We’ve hit the middle – the days are their longest and the sun is it’s hottest. By now most of us (the lucky ones, anyways) have managed to acquire some color. This means it’s time to minimize the makeup and enhance your beautiful summer skin! Take a peek at our favorite cream highlighters – the perfect products to dab on the cheekbones, bridge of the nose and forehead area. Little work with a high pay off, just what we like. Sheer, lightweight and extremely easy to use. Arch Tip: Feel free to apply this on even the barest of faces for a little pick me up! Come one, come all – there’s a shade for everyone! These highlighters pack a little bit more of a punch as they’re slightly tinted. Arch Tip: A little goes a long way, otherwise you risk appearing too shimmery. 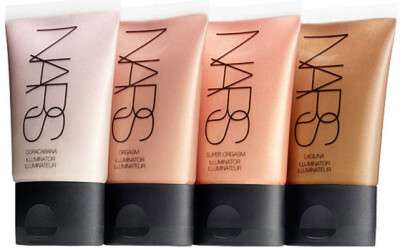 Easily one of our faves, these highlighters differ in that they’re serums. On top of providing an envy worthy glow, they contain ingredients that smooth and nourish the skin while brightening dark spots. 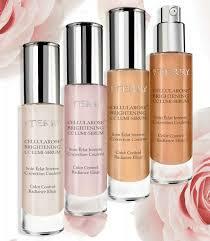 ByTerry calls them ‘color control radiance elixirs’ and they’re just that. 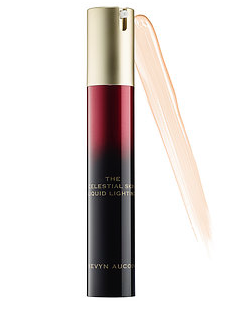 Arch Tip: Add a pump to your foundation for an all over, subtle glow. Never appearing shimmery, greasy, or glittery, this waterproof highlighter lasts for 12-hours. Hello poolside! The cream/gel hybrid glides on easily and absorbs quickly. It’s infused with jojoba and honey to help moisturize dry, sun exposed skin. Arch Tip: It can be used as a primer!